3 March 2019 - RS Sailing admire the D-Zero up close and personal. 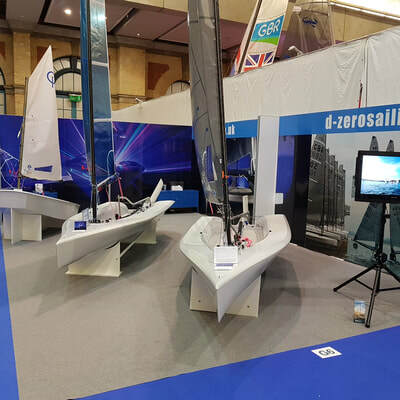 ​Ricky and Jon from RS Sailing visited the stand and spent a while admiring the D-Zero, and probably wondering why they didnt build such a quality dinghy ! [sic] Fishing for information about the Olympic trials, they were keen to discuss our sails, boat design, any issues with the boat - strangely denying any issues with the Aero, hmmm. They weren't the only ones as Laser, Harken, Liros all came and had a good look. Laser also wanted to know who made our stands and were shocked when they were told they were handmade by the owner - maybe I should charge for my services ?. Harken loved our led lights - we're happily telling them how and where !! 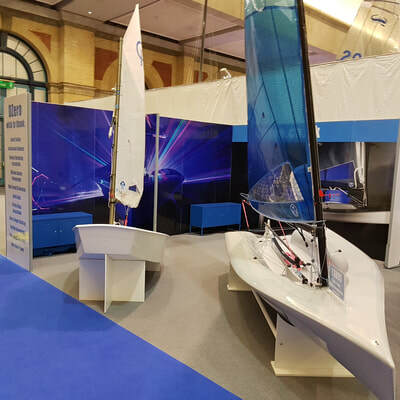 RYA Dinghy Show - 2nd & 3rd March, Stand F12. Come see the latest D-Zero's - both blue and grey rigs, Optimists and the D-Zero Class Association; and on the Saturday, come and say hello to the Devoti team ! 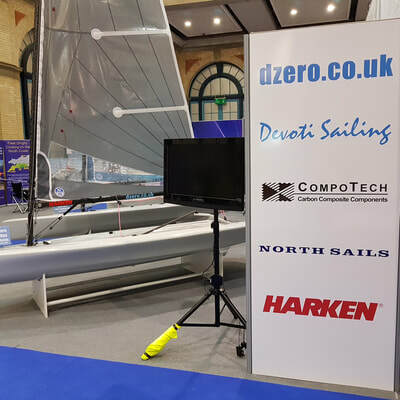 We also have some new bimbles for the D-Zero, an even brighter stand, plus our Brand Ambassador for the Devoti Optimist, Megan Farrer; and plenty of D-Zero owners to have a chat to ! 1 January 2019 - Nick Craig orders a D-Zero. 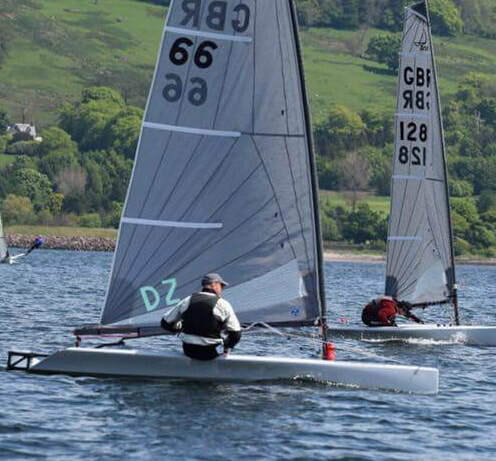 Further to coming a very close 2nd at the Brass Monkey using the Class Assoc Secretaries D-Zero, Nick commented "I was surprised just how good a boat the D Zero is! She is very refined upwind with lots of grooves and gears. A click on the mainsheet or small traveller adjustment make such a difference yet the feedback from the Zero is powerful so you can when it is right - very rewarding! Downwind she is a joy to sail with the perfectly designed hull shape cutting through the water so nicely and she feels very responsive. She is very easy to sail with control lines all accessible and working well but with so many gears and such responsiveness, I expect hard to sail well.At 87kg, I thought I might be too big for the Zero but she powers up surprisingly early with a very efficient rig and relatively narrow hull. After just a few sails in the Zero, I ordered a new one!" We welcome Nick into the class, and look forward to others who want a challenging yet rewarding sail ! 1 October 2018 - Finance - its a challenge for us all ! Many ask how they can budget a D-Zero or Optimist, when there are so many other financial needs. Pegasus Finance work closely with us to provide the best finance option for you ! 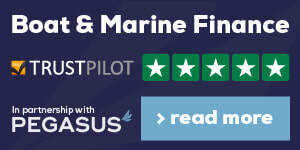 Well respected, highly recommended (Trustpilot), let them see how they can get you into a Devoti ! 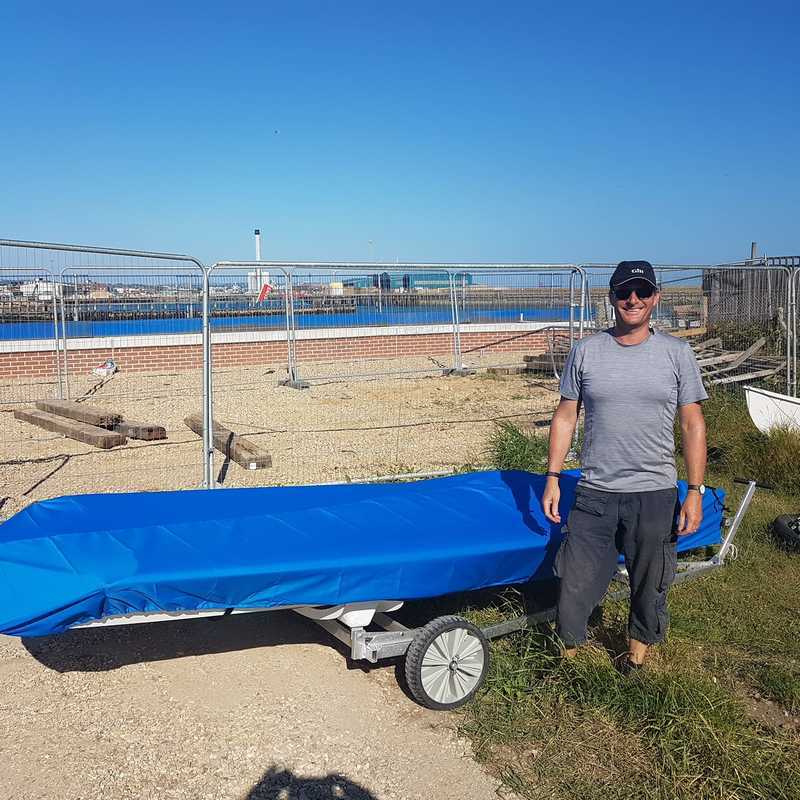 26 July 2018 - Front cover needs an update, so here's new owner Chris racing GBR303 at Shoreham. Great start for the second race ever in the D-Zero, and certainly giving those other single handers and asymmetrics a run for their money. 30 June - Less than 24 hours from demo to delivery ! Shoreham sailor Chris demo'd the D-Zero at Emsworth on the Friday, ordered and paid on there Friday evening and had his new white D-Zero delivered to Shoreham on Saturday afternoon. The F3-4 was fantastic to show how stable and rewarding the D-Zero is ! Chris words whilst we blasted downwind "I cannot believe how stable and forgiving this is !" - Something all owners know about all too well. 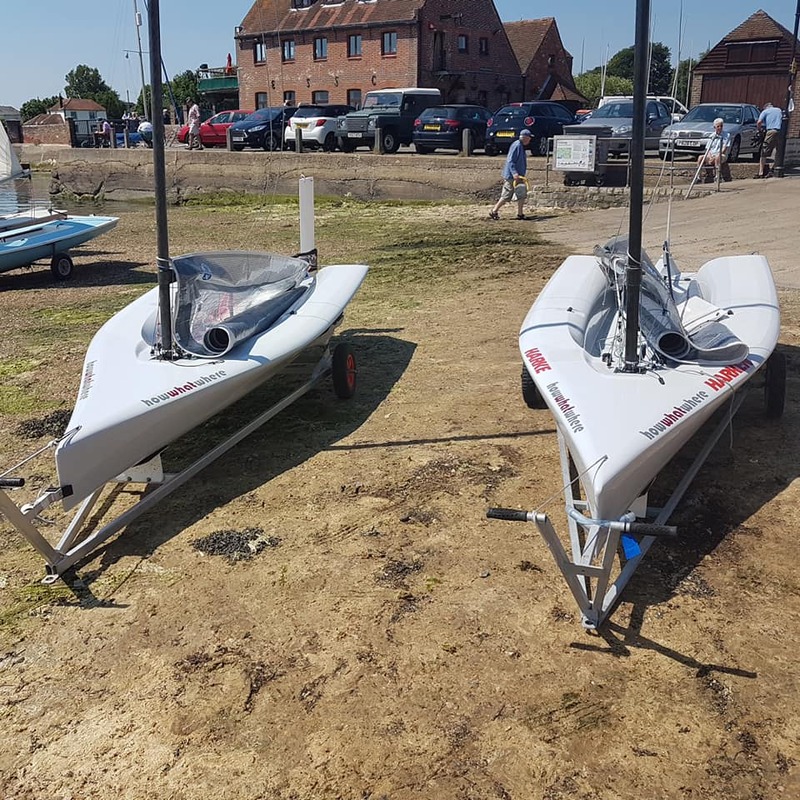 3 June 2018 - DZero's own club Open at Emsworth Slipper SC. 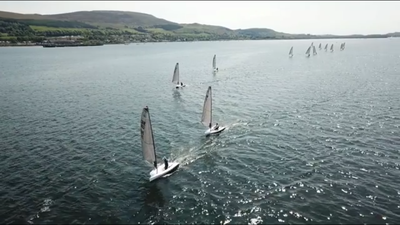 DZero, the UK dealer for Devoti D-Zero & Optimist sponsored an Open Meeting at their own club, as part of the Morgan Sails sponsored Southern Series. 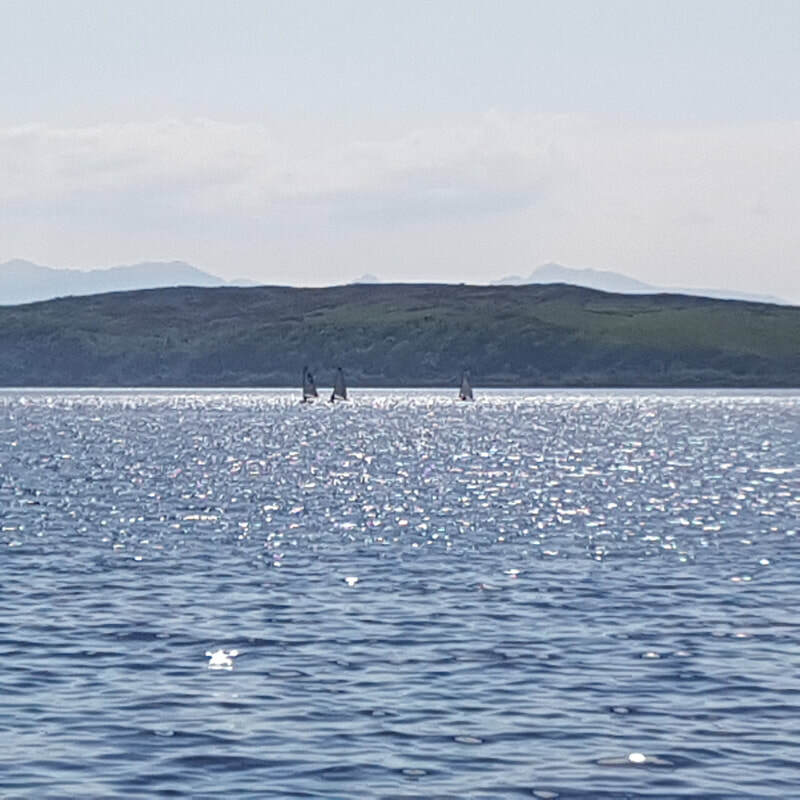 18 sailors met a sea breeze induced wind, giving some challenging conditions. The demo boat sailed by Adam Humphrey, whose wife Jo had purchased a D-Zero the week before, sailed into 1st place in the 1st race, and came 2nd overall. David the dealer came 12th. 19-20 May - Largs Open & Demo Races. The demo D-Zero was back out in action, with several signing up to have a go at one race each, whilst also assisting with mark laying and safety crew. One racer scored an easy 1st showing the others how to do it, however also had time for a quick roll-up ciggie afterwards whilst others finished. 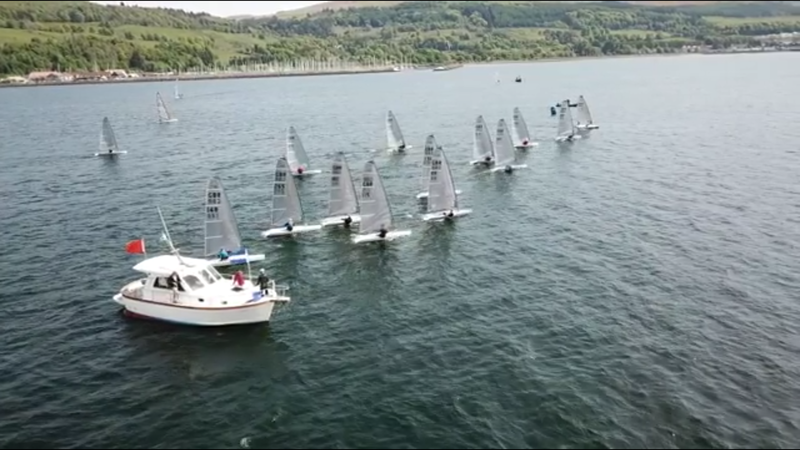 Those Scottish sailors were good as all finished in the top 10 out of 18 sailors. David the dealer took 2nd overall, using the good F4 breeze and increasing to show how the boat could be sailed in breeze and relished in the waves. 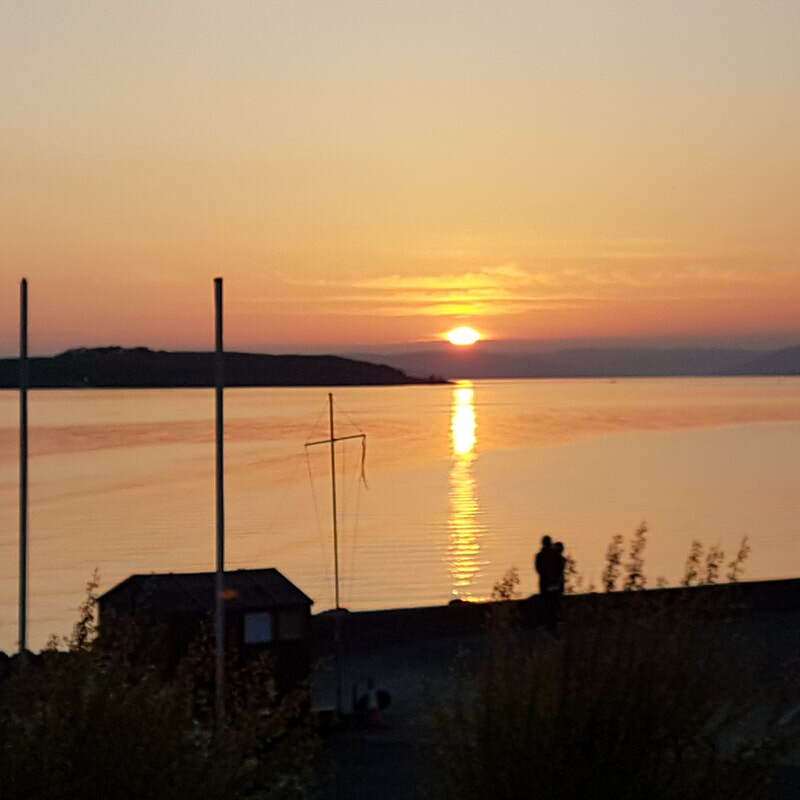 Largs was so well-liked, it is now the venue for the 2020 Nationals ! 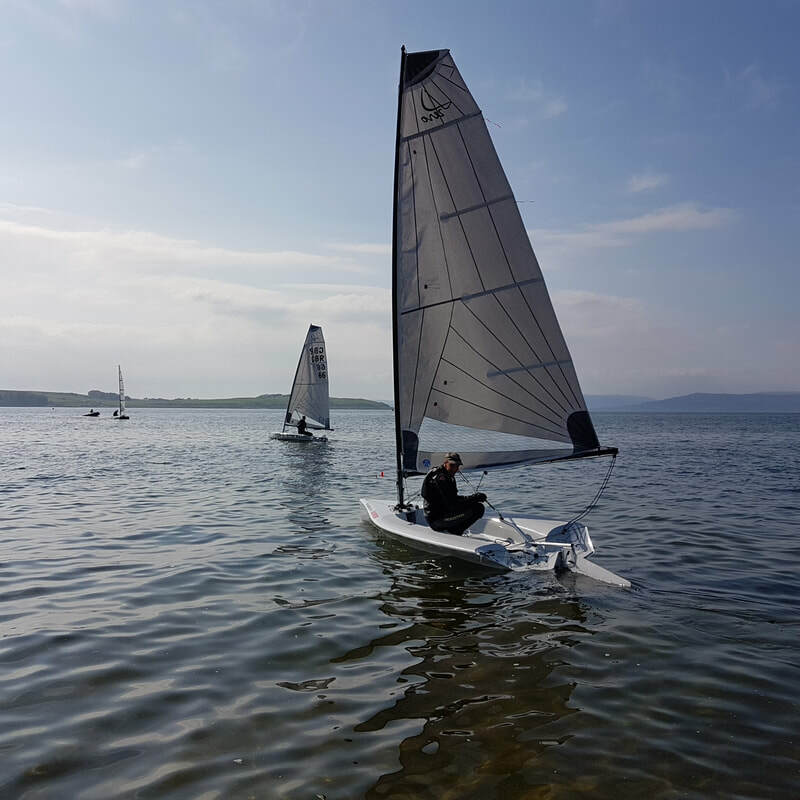 18 May 2018 - Demo day at Largs SC. 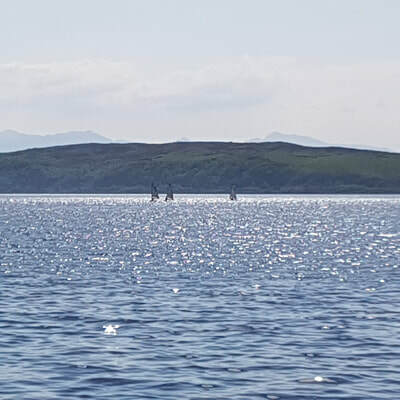 5 sailors came for an afternoon and evening of sailing the D-Zero in light airs, though enough to show the boats worth, with several owners also coming down to have a sail and join the fun. One sailor "Storky" Mclaughlin went on to purchase a D-Zero 2 weeks later and then sailed to 2nd overall in the D-Zero Nationals - an impressive start and one to watch ! 24 March 2018 - First Demo Day at Grafham Water Sailing Club. 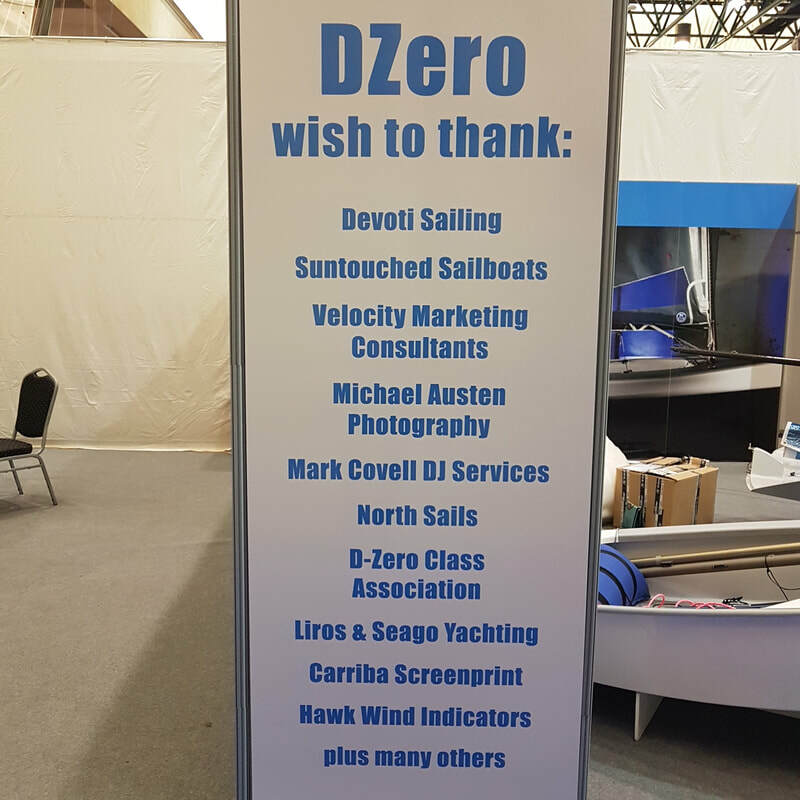 Thanks to all 9 who had a demo sail, including a well-known sailing holiday company - hopefully the D-Zero will be one of their 2019 dinghy range ! Thanks also to GWSC for helping co-ordinate, publicise, and keep an eye on the water. Pete McCoy also held a training session in the lightest of airs ! 6 March 2018 - The winner of "Win a Days Training in a Devoti D-Zero" is Jo Norrington of Herne Bay. Jo is really looking forward to it, and we'll be heading up there soon to give Jo a day to remember and hopefully some D-Zero demo's to other potential D-Zero owners. 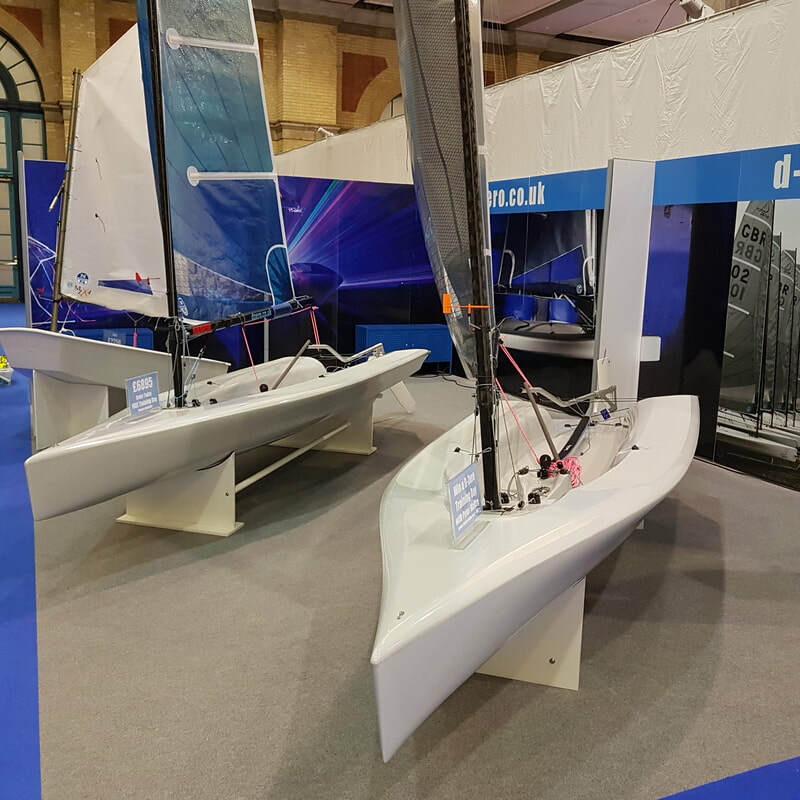 4 March 2018 - RYA Dinghy Show completed, with hundreds of enthusiastic and keen to demo sailors in both the Optimist and D-Zero. First D-Zero was purchased in ten minutes after opening - in fact david Summerville was on the stand just before show opening with credit card in hand 1 Thanks David. We were also lucky enough to have Saskia Clark, Dan Holman and the Optimist European Champion India Page-Wood visit the stand. Saskia loved the D-Zero design, Dan talked of sailing at the Nats, and India loved the Devoti Oppie and wished she had one ! 20 February 2018 - First Demo Event announced. 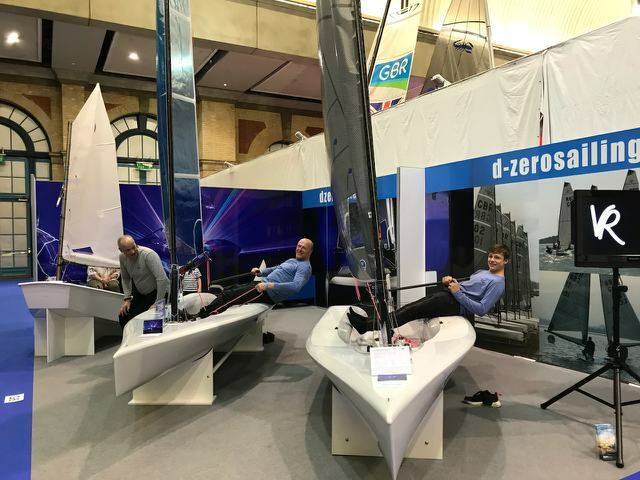 DZero are very keen to provide as many demonstration sails as possible around the UK, showing why we love the D-Zero and why you would love to be sailing one ! First event is at Graham on 24/3 - please visit the Demos & Training page to book an hours slot, or see where we will be demo'ing next. 7 February 2018 - Team Rider Peter McCoy joins the team. 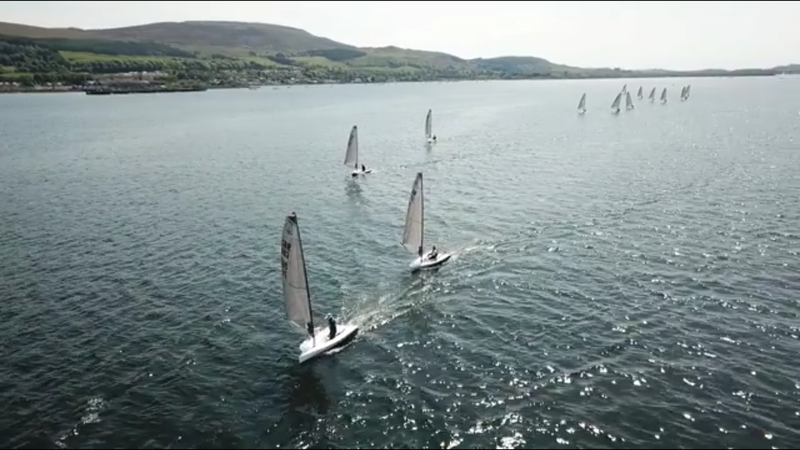 Former British Sailing Team Finn sailor, and training partner to Giles Scott joins the team to help demo the boats, be involved with the Class training, and show how to get the best out of the D-Zero. 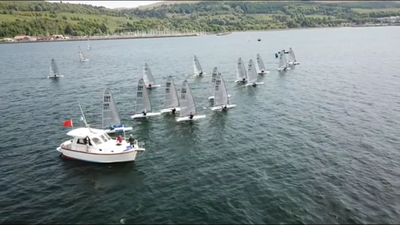 Pete will be sailing as many events as possible including the Nationals, and campaigning a J70 team. We cannot wait to go sailing with Pete ! 29 Jan 2018 - New DZero website goes live ! In readiness for the formal new business launch on Feb 1, the new website has gone live and will be kept bright and up-to-date, with blogs, news, plenty of graphics, and a new ecomm store in time for the show. Check out our new Facebook page - dzero.co.uk, and also our Instagram under the same name. 16 Jan 2018 - Having fun at the photoshoot. Behind the scenes at our photoshoot, taking shots that the marine industry do not usually go for ! The D-Zero meets Top Gear, with the latest LED lights, lasers and smoke, all shot in the dark. Mike Austen & Toby Adamson working their magic with long exposures and light-washing, whilst Mark Covell brought in his tech know-how with lasers and smoke ! All we needed was the music, which Mark nearly brought also ! !